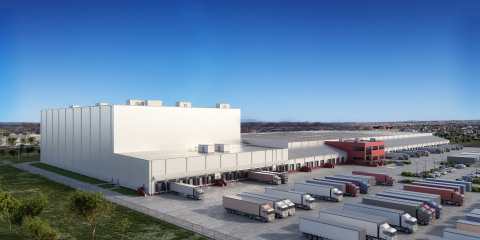 NOVI, Mich.--(BUSINESS WIRE)--Lineage Logistics, LLC (Lineage), the world’s most innovative and trusted provider of temperature-controlled supply chain solutions, broke ground this week on a significant expansion to its Sunnyvale, Texas warehousing and distribution facility in the Dallas-Fort Worth logistics market. Harnessing the power of some of the world’s most advanced automation and robotics warehouse technologies Lineage will nearly double the pallet capacity of the current facility while occupying less than a third of its current footprint. This project helps to cement Lineage as the most innovative as well as the largest automated solution provider in the temperature-controlled warehousing industry. The facility will be Lineage’s first fully automated development in North America and is designed to support maximum flexibility and responsiveness. Implementing a process called Dynamic Profiling, Lineage will have the ability to adapt to a wide range of customer needs in Sunnyvale over time. The facility’s Automated Storage and Retrieval Systems technology will move product seamlessly through a nine-level, 100-foot ceiling location, while the significant corresponding increase in storage density will greatly reduce energy consumption. The expanded facility, located at 367 Long Creek Road, will add approximately 94,000 new square footage to the existing 311,885 square foot location and have the ability to house roughly 24,000 additional pallet positions. When completed, Lineage estimates that nearly 30 new jobs will be created from the local workforce to support operations. The facility is currently under construction and is expected to begin full operation in 2019.